New Slim PS3 Model Will Features PS2 Backward Compatibility? Surprise, surprise, after my report earlier on the brand new CECH-3000 model, i missed some bits of interesting piece on Sony’s Japan official website. 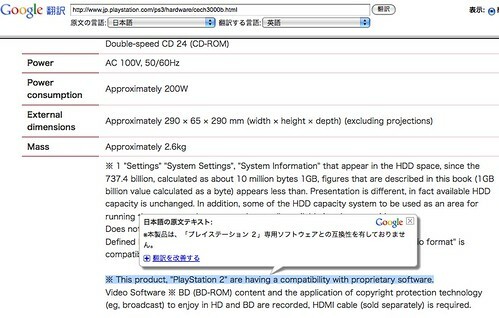 Recently, a report has discovered an added PS2 compatibility feature on the translated page of the new PS3 slim console. ※ This product, “PlayStation 2” are having a compatibility with proprietary software. This product, “PlayStation 2” are having a compatibility with proprietary software. This product have a compatibility with “PlayStation 2” proprietary software. This product doesn’t have a compatibility with “PlayStation 2” exclusive software. Android is, “iOS” not equipped with compatible only with the iPhone. Android, “iOS” not equipped with compatible only with the iPhone. Android, “I Pseudorabies” are having a compatibility with only iPhone. Product, “PlayStation” are having a compatibility with proprietary software. This product is a “PlayStation 3” and not equipped with dedicated software compatibility. This product, “PlayStation” and not equipped with dedicated software compatibility. This product, “PlayStation 2” and not equipped with dedicated software compatibility. This product, “PlayStation 3” and not equipped with dedicated software compatibility.